This versatile veggie tomato sauce is a hit at our house. It is my go-to sauce on pizza night and also perfect for many other quick weeknight meals. Skip the store bought stuff and make this sauce instead! Honestly, I could eat this versatile veggie tomato sauce straight from the pot with a spoon. It is delicious, packed full of flavor and nutrients, as well as checks off a lot of family meal requirements. Veggies – check! Versatile – check! Very easy – check! I will often use this versatile sauce more than once during the week for completely different entrees. Pizza, pasta, eggplant parmesan, sloppy joes, baked eggs….you get the idea! Sauces are also great as a dip for appetizers or after-school snacks like baked mozzarella sticks, breadsticks or crostini. 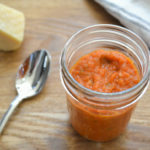 Tomato sauces are not only great for versatility, but also because you can make a huge batch to store for later meals. Tomato sauce freezes well for about three months. If you want to store the sauce in the refrigerator, I recommend using it within three to four days. 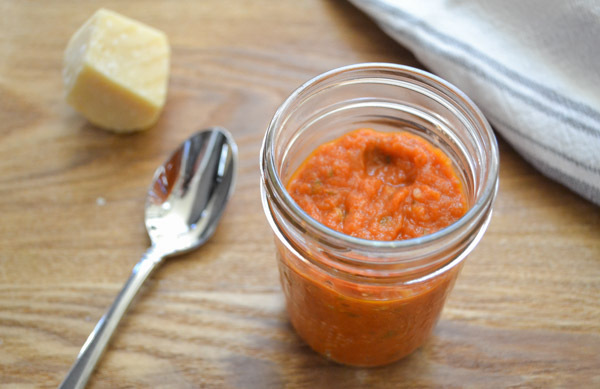 I created my versatile veggie tomato sauce when my kids were toddlers. If you have ever met a toddler, you probably know that they are peculiar little creatures. One day they love something and the next day they are throwing it at you! I recently experienced this again when babysitting my niece a few weeks ago. My little munchkins were no different and I had to get creative when they no longer wanted some of their previously enjoyed foods. One food group my kids always liked were carbs, so I created this sauce specifically for our homemade pizza nights. I can still picture their sweet, chubby little faces covered in sauce! I feel better about serving them a pizza that I know is packed with more nutritional value than your average takeout pizza. 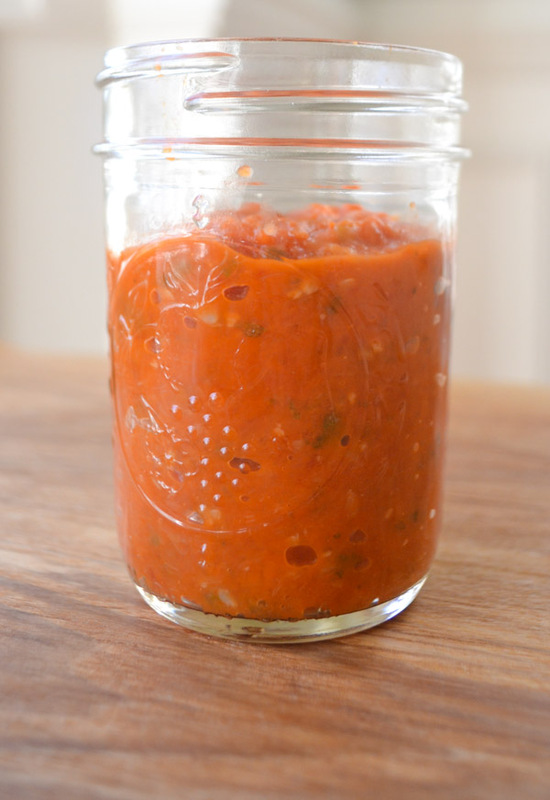 Also, homemade tomato sauce is so easy and cheap, as well as lower in sugar and sodium. The incorporation of vegetables is also a great way to use anything lingering in the veggie bin from the week. While I typically use carrots, onion, garlic and zucchini in my tomato sauce, the addition of yellow squash, mushrooms, eggplant or peppers also work well. This sauce is easily altered depending on individual taste buds or the ingredients in your refrigerator. An immersion blender is definitely your friend with this recipe. While it is great to have a “vegelicious” sauce, I think a smooth, less chunky sauce works best for versatility. You will also notice that the color of the sauce changes based on the vegetables you choose. The addition of carrots to the sauce dampens the red hue, which is not a big deal, but definitely changes the visual appearance of a dish. My preference is to use this sauce in dishes where the sauce is not center stage, but rather an accoutrement or baked into a recipe. If your child is averse to sauce in general (we went through this too! ), I suggest baking some dough with seasoned olive oil and cheese and serving the tomato sauce as a side for dipping. I firmly believe that giving kids choice and control at mealtimes is critical for building healthy eating habits. Healthy dipping sauces are great because they are able to control the amount of new or less preferred foods, while still being presented with new options. 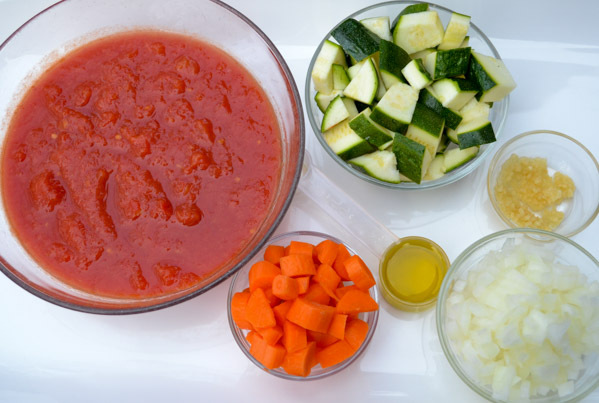 Let me know when and how you choose to use this versatile veggie sauce! 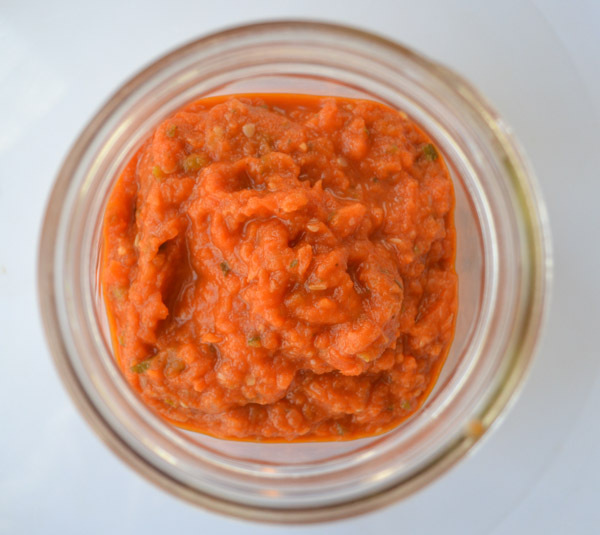 A veggie-packed, versatile tomato sauce perfect for pizzas, pastas or as a dipping sauce! You will find so many great uses for this sauce throughout the week or freeze extra for another busy week. Heat oil over medium heat in Dutch oven. Once oil is hot, add onions, carrots and garlic to saute; stirring occasionally until onions are golden and carrots are semi-soft. Add zucchini and saute, stirring occasionally until al dente (approximately 4-5 minutes). Add 1-2 pinches of salt to draw out liquid from zucchini. Add tomatoes and simmer, stirring occasionally. Add 2-3 pinches of sugar while simmering. Once all ingredients simmer thoroughly, blend using immersion blender or transferring to a blender.